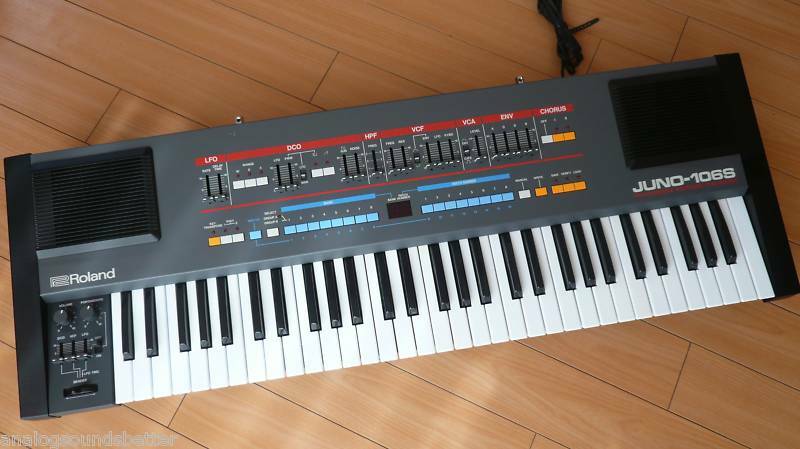 Over the weekend I picked up a used Roland Juno 106S version for $50 bucks at a used music shop here in Nagano-city, Japan. 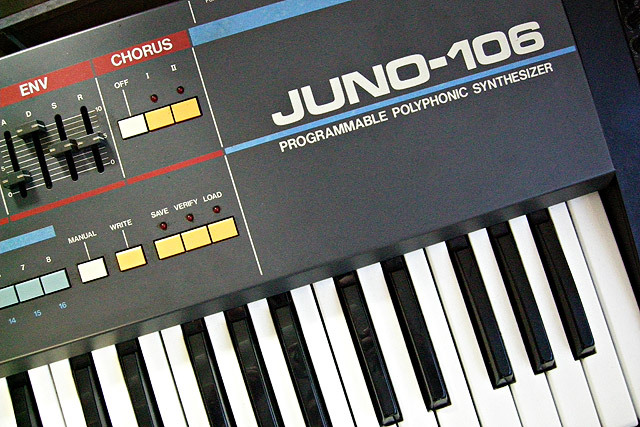 The Roland Juno 106S is in excellent cosmetic shape with almost everything functional. 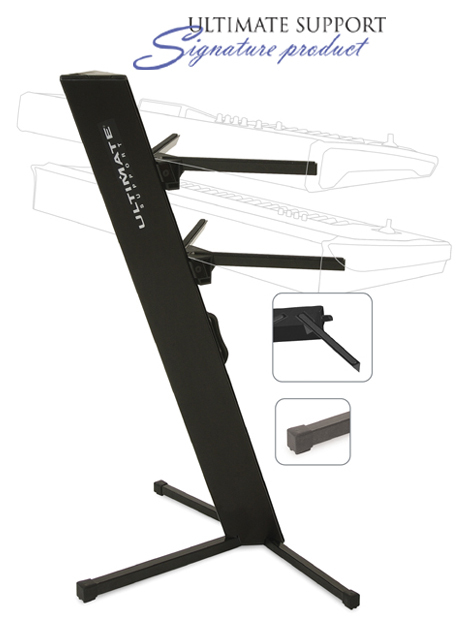 Like the Roland Juno 106, the 106S is identical with the exception of two speakers built in and a sheet music stand bracket that is attached on the back. Inside you have the same black resin covered voice chips of which five are working perfectly with one likely to go shortly. 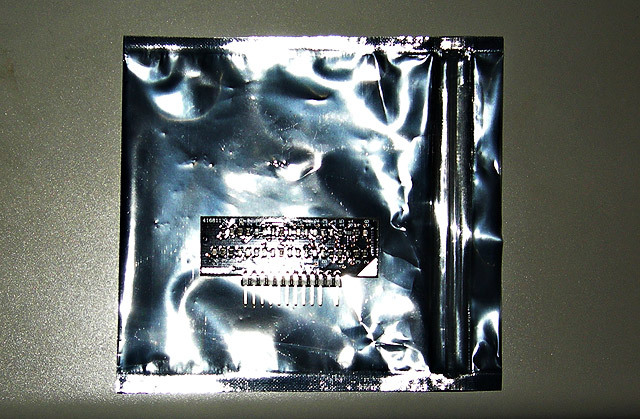 The level of the sixth 80017A chip is lower and you can hear a slight crackle. Thus I’ll definitely be sending the voice chip board into the Synth Spa for refurbishing like my other Juno 106. Also, I am experiencing a pulsating crackle noise with the Chorus when either Chorus 1 or 2 are selected. It’s likely the MN3009 chips need to be replaced which I’m currently consulting the Synth Spa about. Overall it should be pretty reasonable to get the Roland JUno 106S in perfect working order. My other Roland Juno 106 is sounding awesome and I love playing it. Having DUAL Juno 106 synths should be fun especially since they both have built in MIDI. It’s also nice to have a spare as well. I don’t know much about the naming of the Roland Juno-106S other than I’ve heard the 106S was released in Japan while the Roland HS-60 was released overseas. I like how the Roland Juno 106S is painted just like the regular Juno 106. They both sound identical to me and they should because they both have the same voice chip board inside when I checked. The Juno 106S is slightly deeper because the voice chip board is located under the keys to make room for the speakers. The power supply area is moved more towards the middle. Everything else is identical. The Roland Juno 106 and 106S synths are fantastic. I really love the simplicity of them and how great they sound. It was a welcome surprise to find this second board and at such a great price. UPDATE: I have sent the voice chip board, panel board, jack board, and cpu board to The Synth Spa recently. I wanted to swap out the old chips for some “unwrapped” ones. In addition I am experiencing some crackle noise with the Chorus so that will be check on. Finally I plan to have a general cleaning and check-up with the other panel and cpu boards with the battery getting replaced as well. I’m confident the Roland Juno 106S will run sweet like my other one and last a long time as well. Allen does a great job at the Synth Spa. I’ll update my article with the progress made. Thanks!